In its new publication titled “Sterile Injectable Drugs Market: Global Industry Analysis and Forecast, 2016–2024,” Persistence Market Research explains how companies in the global sterile injectable drugs market are mainly focusing on geographic expansion by establishing facilities in proximity to target markets and consolidation of existing manufacturing capabilities to gain larger market share. This eight year forecast of the global sterile injectable drugs market further points out that big pharmaceutical companies acquiring firms in the Asia Pacific region are expected to strengthen market position and create sustainable positioning. Persistence Market Research differentiates the strategies of key players and highlights that companies across the globe are focusing on strengthening their position through acquisitions and are developing manufacturing capabilities to achieve economies of scale. Moreover, market players are targeting North America and Europe by launching patent protected and complex biologics in the global sterile injectable drugs market. While researching this report, the team of analysts have found out that North America, Europe and Asia Pacific regions are target markets for major players operating in the global sterile injectable drugs market. According to the report, the bulging products pipeline for parenteral administration, a conducive business environment in developing economies, the surge in local production of generic injectable drugs and presence of a large patient pool are promising factors for investors to invest in the aforementioned regions. The report also covers an analysis of the supply chain operations and commercialization of the global sterile injectable drugs market. Primarily, the report presents an overview of the global sterile injectable drugs market. This is followed by the market taxonomy and a section that underlines the various factors influencing the growth of the global sterile injectable drugs market. Yearly change in inflation rate has not been factored while forecasting market numbers. Top-down approach has been used to calculate market forecast, while bottom-up approach by therapeutic areas has been used to counter-validate market numbers. Indicators such as R&D expenditure, research funding from government and non-profit organizations etc. have been considered to arrive at the indicated market numbers. A section of the report covers the global sterile injectable drugs market performance in terms of revenue contribution from various segments. 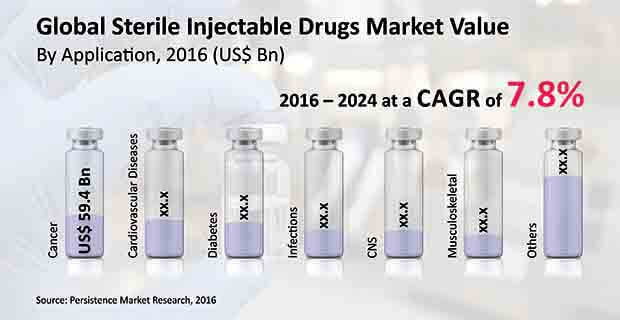 This section also includes Persistence Market Research’s analysis of key trends, drivers, restraints and opportunities, which are influencing the growth of the global sterile injectable drugs market. Impact analysis of key regional growth drivers and restraints based on the weighted average model along with key region-specific trends is included in the report to better equip clients with information and hidden insights. Finally, Persistence Market Research also provides key strategic recommendations for both existing and new players in the global sterile injectable drugs market to emerge sustainably profitable. Persistence Market Research analysts have carried out in-depth secondary research to ascertain overall market size, top industry players, and top products. The team of analysts has further conducted extensive interviews with industry experts, industry players, retailers and distributors based on a comprehensive discussion guide formulated by Persistence Market Research. Data so gathered is validated using the triangulation method, wherein secondary research (consisting of company websites, their annual reports, white papers and financial reports), primary research and Persistence Market Research’s analysis contributes to the final data. The analysts have also considered paid publications such as Factiva, GBI, Genios, and Meltwater while researching the global sterile injectable drugs market. It is imperative to note that in an ever-fluctuating global economy, the report not only conducts forecasts in terms of CAGR but also analyzes the market on the basis of key parameters such as Year-on-Year (Y-o-Y) growth to understand the predictability of the market and to identify the right opportunities likely to emerge in the global sterile injectable drugs market. Another feature of this report is an analysis of all key segments of the global sterile injectable drugs market and their revenue forecast in terms of absolute dollar opportunity. This is usually overlooked while forecasting the market. However, absolute dollar opportunity is critical in assessing the level of opportunity that a provider can look to achieve, as well as to identify potential resources from a sales perspective in the global sterile injectable drugs market. Further, in order to understand key market segments in terms of growth and performance in the global sterile injectable drugs market, Persistence Market Research has developed a market attractiveness index to help providers identify real market opportunities. Availability of wider treatment options and rising prevalence of cancer is expected to fuel the market demand for injectable anti-cancer drugs over the forecast period. Considering the BPS analysis, the cancer segment was estimated to account for more than 10% revenue share of the global sterile injectable drugs market by the end of 2016 and is expected to lose more than 100 BPS in market share by 2024 over 2016. Considering the Y-o-Y growth and absolute $ opportunity, the cancer segment is anticipated to create an absolute $ opportunity of more than US$ 4 Bn in 2017 over 2016. By the end of 2024, the cancer segment is projected to reach close to US$ 100 Bn in value, expanding at a CAGR of 6.5% over the forecast period. Revenue from the cancer segment in the global sterile injectable drugs market is expected to increase 1.7X by 2024 end as compared to that in 2016. Rising prevalence of chronic illnesses – especially cancer – across the globe is anticipated to boost the demand for sterile injectable drugs over the forecast period. The market for sterile injectable drugs is also spurred by an increasing number of drug manufacturers focusing on the production of drugs to treat cancer. Rapid FDA approvals of sterile injectable drugs along with shortened approval times for new drug development in cancer cure is helping accelerate drug supplies and is eventually boosting demand in the global sterile injectable drugs market. High operational costs and discontinuation of injectable drugs for cancer treatment are hampering the growth of revenue across the globe. Sterile drugs require complex equipment for manufacturing. Each sterile drug needs proper certification and sterilization before production. This leads to high operating costs and high debt levels. Moreover, the regulatory cost burden is also high due to FDA rules regarding maintaining a high degree of care in the manufacturing, packaging, storage and distribution of sterile injectable drugs. This factor is hindering revenue growth of the global sterile injectable drugs market. Competition from low-cost manufacturers has led to a discontinuation of many products in the cancer segment. Further, consolidation of the supply chain by large pharmaceutical companies has led to shutting down of their existing manufacturing sites. This particular factor is creating a negative impact on the cancer segment and subsequently the global sterile injectable drugs market. By application type, the cancer segment dominated the North America sterile injectable drugs market in revenue terms in 2015 and is projected to continue to do so throughout the forecast period. The cancer segment is expected to be the most attractive market segment, with an attractiveness index of 1.2 during the forecast period. The use of injectable drugs in oncology is expected to grow at high rates in North America. Demand for drugs administered in injectable format is fueling the growth of sterile injectable drugs for cancer in Europe. Poor access to essential medicines and vaccines, low-quality healthcare, malnutrition, poverty and a tropical (warm) climate are factors promoting the demand for essential medicines in sterile injectable format for faster action against cancer in Africa. Companies operating in the global sterile injectable drugs market are striving to consolidate their market position by means of acquiring small and large injectable firms in the market. Companies are also focusing on increasing their manufacturing capacities to achieve greater economies of scale and are concentrating on diverse global markets to improve their geographic foothold in the global sterile injectable drugs market.